HAWAIIAN SHIRT Classic Summer PIERRE CARDIN Vintage 80's Tropical Print ALOHA Men's Size L! HAWAIIAN SHIRT Classic -= PIERRE CARDIN =- Tropical Print ALOHA Men's Size L! Shirt: Shoulder seam to Shoulder seam across the top 21 inches, Underarm to Underarm/Chest 50 inches around, Waist 48 inches around and Overall Length is 33 inches from the top center back neckline to the hemline! **Condition** In Excellent, previously owned condition with no visible flaws to report! You may want to launder this shirt prior to wearing, as it has been stored away for many years! At Threads and Gurlz Gone Glam Lingerie Credit Cards are gladly accepted through our Direct Checkout..., Cashier's checks and Money orders are gladly accepted as well! Thanks so much! Be sure to take a peek in the rest of the store for more vintage Hawaiian Shirts, Gunne Sax Gowns, Angora, Mohair, Leather and Fur Boots, Designer Leather, Leopard and Lace! Your transaction on eCrater is COMPLETELY ANONYMOUS... NO ONE can see what you've purchased, besides you and I... and your package will always be carefully wrapped and shipped DISCREETLY with no indication what~so~ever of it's contents! VINTAGE HAWAIIAN SHIRT Green Blue ISLANDS Made in HAWAII Floral REVERSE Print Men's Size S! VINTAGE HAWAIIAN SHIRT Surfer VLV Tapa McINERNY EARLY 70's Tribal Floral HAWAII MADE Sz M! 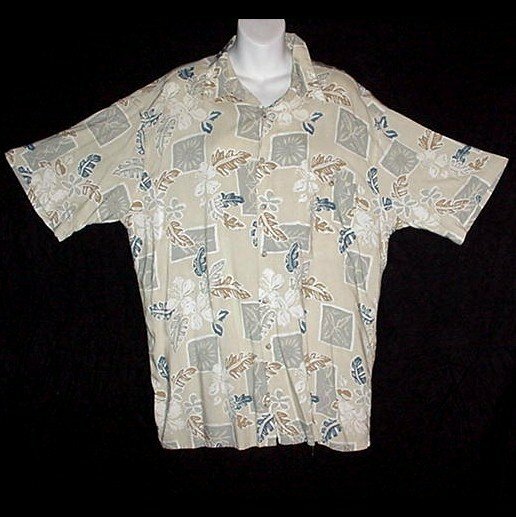 HAWAII SHIRT Classic Bamboo HAWAIIAN SANDS CLUB Tropical Floral Print ALOHA Men's Size M! Collectible VETERANS of FOREIGN WARS Vintage Pin VFW Ladies Auxiliary Solid Brass 10 Year BADGE! Authentic VINTAGE HAWAIIAN Shirt 1940s Aloha Atomic BLUE TROPICAL PARADISE Silky RAYON Men's L! BIG and TALL SHIRT New York AUTHENTIC KANI JEANS Los Angeles Multi BLUE KARL Men's Size 3XL/3X! VLV HAWAIIAN SHIRT Classic Green BAMBOO 50's Vertical Border Style Print ALOHA Men's Size L! HAWAIIAN SHIRT Surfer Classic VLV Vintage SURF BOARDS Aloha Waves HAWAII MADE Print Men's Size L! HAWAIIAN SHIRT Classic Happy Hour PAU HANA Aloha BIRD of PARADISE Vintage Repro Men's Size XL!